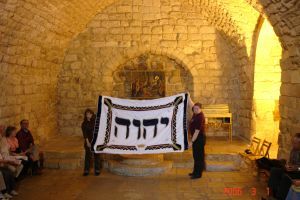 When Ray and I went trip to Israel several years ago, we raised a beautiful, hand-made banner made by Donna Bosn of He Knows My Name ministry. Donna has a great heart of compassion and love, especially for Israel, and she creates very unique banners, with the name of the Lord sewn on them in Hebrew. They are raised in countries all over the world as a declaration to proclaim and lift up the name of Jesus as Lord of Lords and King of Kings. Donna and her husband are truly people after God’s own heart. Thank you so much. The Lord bless you, too. This was one of the most amazing things I’ve ever experienced in my life. I hope one day to go to Israel again.